New details of the molecular process by which our cells consume themselves point to therapeutic potential. These were the first descriptions of what is known today as macro-autophagy (hereafter referred to as autophagy). The term is derived from the Greek “auto,” meaning self, and “phagein,” meaning to eat. During autophagy, the cell consumes parts of itself in a regulated manner. The hallmark of autophagy is the formation of a transient double-membrane structure termed a phagophore. In contrast to secretory transport vesicles, which bud off from an organelle with cargo already enclosed within, the phagophore acquires cargo during its assembly. It may form de novo in the cytoplasm as a free-standing structure, or it may be in contact with an organelle such as the endoplasmic reticulum. 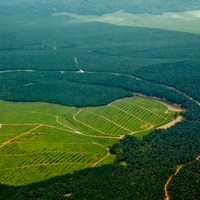 The phagophore expands sequentially, providing tremendous flexibility with regard to cargo capacity. As it expands, it sequesters cytoplasmic components, including proteins, lipids, and even entire organelles. Once its payload is secured, the phagophore closes and matures into an autophagosome, with the sequestered cargo now enclosed in the lumen of this compartment. The autophagosome then delivers the cargo, via membrane fusion, to the lytic compartments—vacuoles in fungi and plants and lysosomes in metazoans—for degradation and recycling. It was the autophagosome that captured the attention of Clark and Novikoff more than half a century ago. Autophagy can be divided into two broad categories, selective and nonselective, based on the nature of what’s being eaten. The most extensively studied and characterized form of autophagy is macroautophagy, which involves the delivery of cellular components to the lysosome (or vacuole in fungi and plants) via a double membrane–bound structure. Two other forms, beyond the scope of this article, are microautophagy and chaperone-mediated autophagy. During microautophagy, the lysosomal membrane invaginates and sequesters nearby cellular materials for degradation and recycling. Chaperone-mediated autophagy, in contrast, is a specialized protein-degradation process involving dedicated lysosomal transporters. Today, autophagy is recognized as a critical process for maintaining cellular homeostasis, as well as for responding to stressors, such as nutrient deficiency, which may potentially compromise cell survival. When a cell is exposed to such stressors, autophagy, which occurs constitutively at low levels to balance the constant synthesis of biomolecules, is strongly upregulated. This upregulation increases sequestration and degradation of portions of the cell, releasing macromolecules back into the cytosol to power essential metabolic reactions and generate energy. The contribution of autophagy to cellular health under both normal and stress conditions implies important physiological and pathological roles for this tightly regulated and precisely orchestrated process. Indeed, autophagy has been found to be instrumental during the course of mammalian development. Additionally, recent research has discovered that autophagy is a critical modulator of a wide range of diseases and disorders. Probing the involvement of autophagy in development and disease is crucial for a more complete understanding of the pathway’s roles, and could have implications for maintaining health or treating disease. While we partially understand its overall morphology and function, information about several steps in this intricate pathway are still emerging. Several catabolic pathways in the cell break down large molecules. 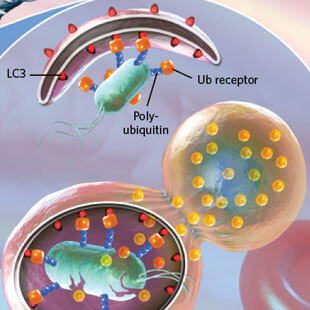 Notably, the conjugation of a small protein called ubiquitin to another cellular protein—often followed by the sequential addition of ubiquitin molecules to generate a polyubiquitin chain—can tag that protein for degradation by the proteasome, resulting in the release of amino acids. (See “The Proteasome: A Powerful Target for Manipulating Protein Levels,” The Scientist, May 2017.) Similar degradation mechanisms exist for other biological polymers such as carbohydrates and lipids. So what makes autophagy unique? The answer lies in the flexibility of autophagosome size and cargo selection. Autophagy can promote degradation en masse for a large number and variety of substrates, enabling cells to quickly and efficiently generate recycled basic building materials in the face of a wide range of nutritional deficiencies. 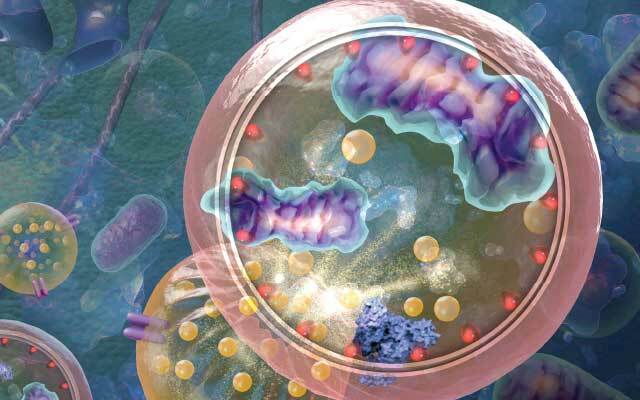 Additionally, autophagy is the only pathway that is capable of degrading entire organelles, either randomly or in a targeted fashion—a critical process for maintaining homeostasis in the complex landscape of the eukaryotic cell. Autophagy is tightly regulated to ensure that it is ramped up only when required, and then in a timely manner. The central metabolic sensor of the cell, the TOR complex 1 (TORC1, or MTORC1 in mammals), is sensitive to the availability of amino acids and growth factors, and inhibits autophagy induction when these components are abundant. When cells are starved of these molecules, TORC1/MTORC1 is inactivated, promoting an increase in autophagy. Meanwhile, other molecular regulators monitor cells for the status of various nutrients, such as glucose, or for energy in the form of ATP, and trigger autophagy when such nutrients or metabolites reach critically low levels. While the overall process of auto-phagy is now somewhat clear to scientists, the field is still hard at work trying to find and fit in many missing pieces of the puzzle. The donor of the membrane for the autophagosome, for example, has not been concretely established. (See “The Enigmatic Membrane,” The Scientist, February 2012.) Similarly, we do not fully understand how phagophore expansion is regulated, or what dictates the frequency of autophagosome generation. Even more questions arise when we consider that many types of autophagy are highly selective, and the initiation and regulation of these processes remain mysterious. Further understanding of these selective pathways is crucial because they are intimately linked to embryonic development, healthy growth, and human disease. phagy occurs during insect metamorphosis.3 A decade and a half later, researchers showed that mutant yeast cells defective in autophagy do not sporulate.4 These were the first hints that autophagy may play a role in organismal development, but only relatively recently have researchers begun to elucidate the process’s contributions to cellular differentiation and development in metazoans. Autophagy is likely also necessary for the fetal-to-neonatal transition that occurs at birth. Homozygous Atg5-null mouse embryos created from unmanipulated oocytes of heterozygous Atg5 mothers survive gestation, probably due to the presence of maternally derived ATG5 in the oocyte, but die within one day of delivery.6 Indeed, a large increase in autophagy is observed in certain tissues in mice, including in the heart, shortly after birth. The cause of this increase might be the temporary but severe starvation induced by the termination of placental nourishment; autophagy helps release the amino acids and energy sources necessary for survival during this period of need. 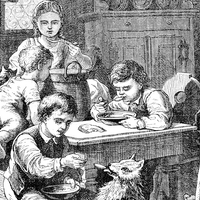 Autophagy has been found to be instrumental during the course of mammalian development. These are but a few of autophagy’s suspected roles in normal development. And as organisms mature, this recycling pathway continues to maintain a healthy balance of functional organelles and basic biomacromolecules in the cellular environment. Further elucidating autophagy’s roles, not only at the mechanistic level but also in terms of physiological outcomes, will be important for understanding how this dynamic process regulates metabolic homeostasis in organisms of all ages. See full infographic: WEB | PDF© N.R.FULLER, SAYO-ART LLCGiven the role of autophagy in physiology, it’s not surprising that dysregulation of the process is tied to a number of pathologies, ranging from infectious diseases to neurodegenerative disorders to cancer. 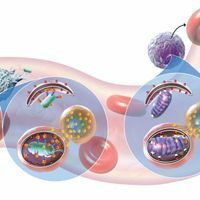 Understanding the relationship between autophagy and disease could be critical to designing effective therapeutic interventions. In this context, autophagy works in concert with components of the innate immune system, such as toll-like receptors (TLRs). TLRs mediate the initial recognition of pathogens, and subsequent TLR signaling promotes inflammation and may stimulate autophagy, at least in part by modifying the autophagy receptors.10 While inflammation is a necessary step in the recruitment of immune cells to the site of infection, an extended inflammatory response can be detrimental to the tissue. Research from the lab of Shizuo Akira at Osaka University in Japan has revealed that loss of the essential autophagy protein ATG16L1 leads to increased production of proinflammatory cytokines in mice.11 This finding suggests that, during the course of the immune response, autophagy not only mediates pathogen elimination but may also limit inflammation to prevent unnecessary tissue damage. In PD, the loss of mitophagy has been identified as a key factor in pathogenesis. Although most PD cases are sporadic, mutations in the mitophagy-related genes PINK1 and PRKN are commonly associated with familial PD. And in 2016, research from the Stanford University School of Medicine laboratory of Xinnan Wang indicated that sporadic cases of PD may also be intimately connected to mitophagy deficiencies.16 This is not unexpected, because neurons heavily depend on mitochondrial ATP synthesis for carrying out energy-intensive processes such as generation and transmission of action potentials, neurotransmitter trafficking, and synaptic signaling. Therefore, mitochondrial homeostasis is critical for proper neuronal function. Neurons use mitophagy to selectively eliminate damaged mitochondria that are not only inefficient at producing ATP, but also generate high levels of reactive oxygen species (ROS), which promote protein and lipid oxidation and DNA damage, causing further cellular dysfunction. The ROS-induced death of mutant mitophagy-deficient neurons is likely a major factor in PD pathogenesis. Mutations in the mitophagy-related genes PINK1 and PRKN are commonly associated with familial PD. Autophagy has also been linked to cancer. In 1999, the Levine group made the landmark discovery that mice with only one functional copy of the autophagy-related gene Becn1 exhibit increased tumorigenesis.17 In contrast to the apparent role of autophagy in blocking tumor initiation, however, there is evidence that autophagy can also promote malignancy in established tumors. The duality of autophagy’s role in cancer is partially explained by the factors involved in tumor generation versus progression. Oncogenic transformation is promoted by stress factors such as genomic instability, metabolic disruption, and mitochondrial dysfunction; auto-phagy actively suppresses these stresses and thereby inhibits tumor initiation. However, once a tumor has formed, the playing field radically changes. 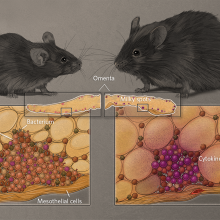 Cells within the tumor have increased metabolic demands due to faster growth and proliferation rates, but these cancerous cells are not well supplied with nutrients by the vasculature. These cells meet their metabolic needs in part by upregulating autophagy. Because cancer cells rely on autophagy for survival, inhibiting the process is an intriguing strategy for antitumor therapeutics; however, limiting autophagy can increase susceptibility to infection and neurodegeneration.20 Therapeutically targeting a pathway as critical as autophagy is not straightforward. As a scientific field, the study of autophagy is at a very exciting juncture. 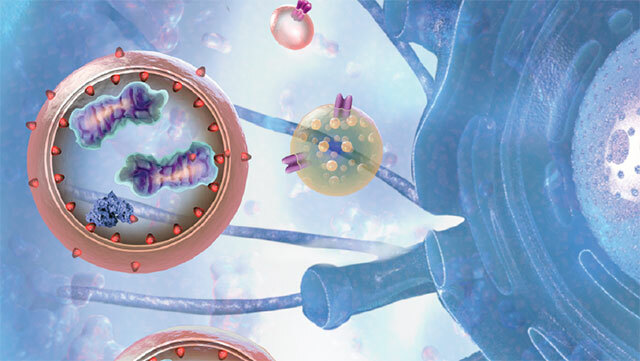 Although researchers have partially uncovered some of the mechanisms related to autophagy initiation, progression, and regulation, our understanding of the role of autophagy in development and disease is at an early stage, and there are still more questions than answers concerning the functions of the autophagy-related proteins. Further realization of the role of the process in pathophysiology promises to reveal as yet unanticipated avenues for therapeutic intervention. We already knew that we must eat to live, and it’s now clear that this can sometimes extend to eating ourselves—at least on a cellular level. Vikramjit Lahiri is a second-year PhD candidate in Professor Daniel J. Klionsky’s laboratory at the University of Michigan in Ann Arbor, where they study the molecular details of autophagy in the budding yeast Saccharomyces cerevisiae. S.L. Clark Jr., “Cellular differentiation in the kidneys of newborn mice studied with the electron microscope,” J Cell Biol, 3:349-62, 1957. A.B. Novikoff, E. Essner, “Cytolysomes and mitochondrial degeneration,” J Cell Biol, 15:140-46, 1962. J. Beaulaton, R.A. Lockshin, “Ultrastructural study of the normal degeneration of the intersegmental muscles of Anthereae polyphemus and Manduca sexta (Insecta, lepidoptera) with particular reference to cellular autophagy,” J Morphol, 154:39-57, 1977. M. Tsukada, Y. Ohsumi, “Isolation and characterization of autophagy-defective mutants of Saccharomyces cerevisiae,” FEBS Lett, 333:169-74, 1993. S. Tsukamoto et al., “Autophagy is essential for preimplantation development of mouse embryos,” Science, 321:117-20, 2008. A. Kuma et al., “The role of autophagy during the early neonatal starvation period,” Nature, 432:1032-36, 2004. M. Sato, K. Sato, “Degradation of paternal mitochondria by fertilization-triggered autophagy in C. elegans embryos,” Science, 334:1141-44, 2011. Y. Wei et al., “Prohibitin 2 is an inner mitochondrial membrane mitophagy receptor,” Cell, 168:224-38.e10, 2017. Y. Rikihisa, “Glycogen autophagosomes in polymorphonuclear leukocytes induced by rickettsiae,” Anat Rec, 208:319-27, 1984. P. Wild et al., “Phosphorylation of the autophagy receptor optineurin restricts Salmonella growth,” Science, 333:228-33, 2011. T. Saitoh et al., “Loss of the autophagy protein Atg16L1 enhances endotoxin-induced IL-1beta production,” Nature, 456:264-68, 2008. J. Moretti et al., “STING senses microbial viability to orchestrate stress-mediated autophagy of the endoplasmic reticulum,” Cell, 171:809-23.e13, 2017. C.W. Keller et al., “ATG-dependent phagocytosis in dendritic cells drives myelin-specific CD4+ T cell pathogenicity during CNS inflammation,” PNAS, 114:E11228-E11237, 2017. B. Ravikumar et al., “Aggregate-prone proteins with polyglutamine and polyalanine expansions are degraded by autophagy,” Hum Mol Genet, 11:1107-17, 2002. B. Ravikumar et al., “Inhibition of mTOR induces autophagy and reduces toxicity of polyglutamine expansions in fly and mouse models of Huntington disease,” Nat Genet, 36:585-95, 2004. C.-H. Hsieh et al., “Functional impairment in miro degradation and mitophagy is a shared fea ture in familial and sporadic Parkinson’s disease,” Cell Stem Cell, 19:709-24, 2016. X.H. Liang et al., “Induction of autophagy and inhibition of tumorigenesis by beclin 1,” Nature, 402:672-76, 1999. N.S. Katheder et al., “Microenvironmental autophagy promotes tumour growth,” Nature, 541:417-20, 2017. C.M. Sousa et al., “Pancreatic stellate cells support tumour metabolism through autophagic alanine secretion,” Nature, 536:479-83, 2016. G. Karsli-Uzunbas et al., “Autophagy is required for glucose homeostasis and lung tumor maintenance,” Cancer Discov, 4:914-27, 2014.